From past few days i was working on Apache Solr Technologies to index data in one of my projects. Today i wanted to elaborate on this concept, this post assumes that you already have Apache Solr installed on your system, if not please install the latest( > 4.1) version from here. Read the instruction from solr site make the Solr server up and running. Once this Solr is up and running we can go to Admin dashboard by hitting the following url http://localhost:8983/solr. Now its time for us to dive into Spring coding inorder to push data to solr server. this project is written on top of Spring4, SpringData, Solr4, Maven and Eclipse Luna. first lets create a maven project and put the below code in your pom.xml file and the project structure looks as below. The above code is responsible for injecting the database properties and creating the datasource and finally injecting datasource into jdbc template class. Now let us write the solr configuration integrated to spring. Below is the global config file to read the property files and to load other config files also the below code is responsible for detecting different annotations. Now the code concept of spring solr come here, Spring Data Solr, part of the larger Spring Data family, provides easy configuration and access to Apache Solr Search Server from Spring applications. It offers both low-level and high-level abstractions for interacting with the store. Derived queries and annotations for Solr specific functionallity allow easy integration into existing applications. So spring data has provided Repositories to deal with different operations of Spring. Now let us start with our service layer and its implementation followed by DAO and its Implementation classes. Now for making a better abstraction between the dao layer and the quires that are used in that layer i implemented a separate utility class as below. Finally our entity model looks as below. please put the below files in “scr/main/resources” folder of your maven project. Note : please find the log file in d drive as i have given in log4j.properties file. please chage the drive location if you need. Now we have done with the coding part, it is time for deployment, from cmd please navigate to location of project and issue the command as mvn clean install package this should build the project with all the required dependencies and final artifact would be spark-solr.war file. now deploy this war file in apache tomcat under webapps directory and put the below url in your browser. Once we hit the url the controller calls the service layer and from service layer invoke dao layer to ftch the data from database abd returned back to service layer now in service layer we have the object od Solr repository and using that we push the data to solr. 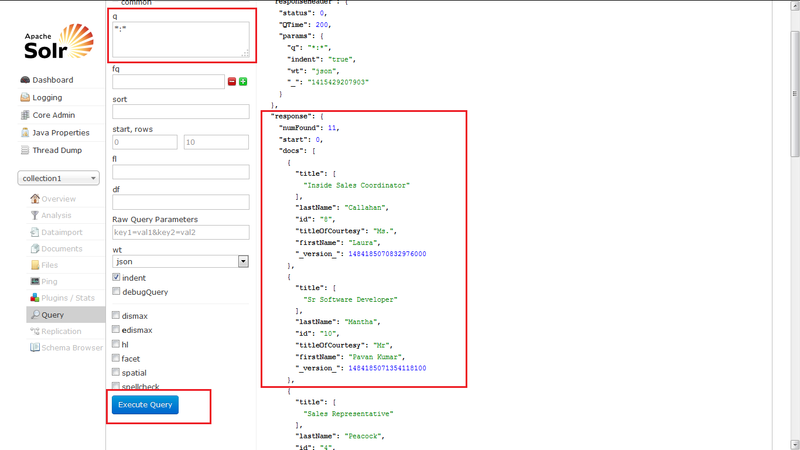 using my previous post we can pull the data from solr and show on custom UI. 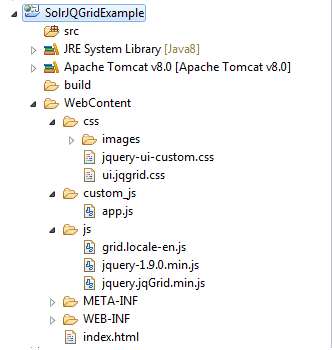 Hi all, from past couple of weeks i was doing a POC on Solr in my project and there came a scenario where i need to pull the data from Solr server and display on JQGrid component. In this post let me show you how to do this task. The project structure looks as below. let’s start with our index.html file as below. Now comes the time for coding the app.js file where the actual logic reside. follow the comments carefully and the script is easy to understand. That is it, finally when we deploy this project to server and see the output it should look as below. 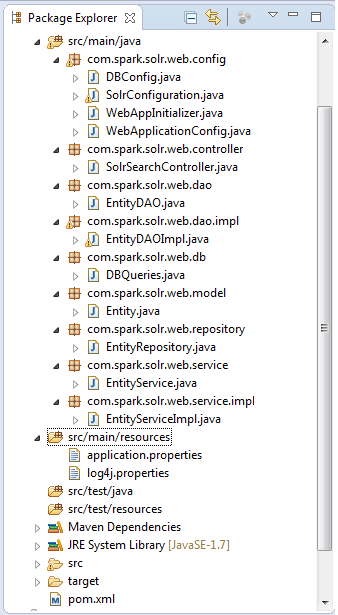 In my next post will be posting about the integration of SpringData and Apache Solr until then.